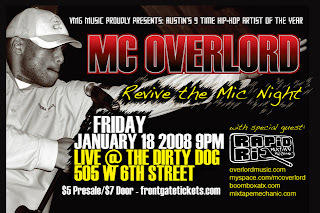 From the ... department... MC Overloard wrote in to tell us about his dope show... Revive the Mic Night @ The Dirty Dog Bar on Jan 18th... with himself, MC Overloard, TrayGod and DJ Rapid Ric! 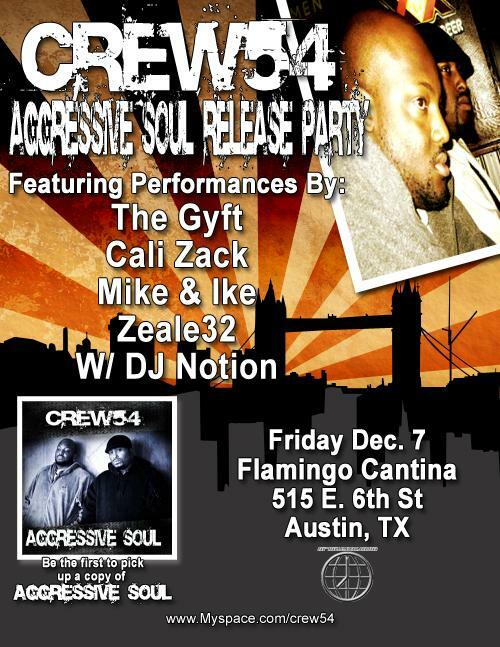 Two of Austin's most notable MC's team up for an epic night of live Hip Hop! Both artists will perform solo sets with a blazing live band and the night will be infused with the sounds of DJ Rapid Ric on the One's and Two's! 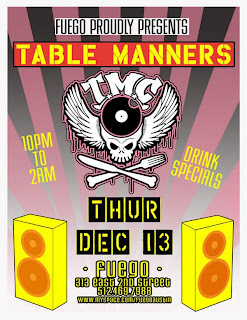 This is a Hip Hop party A-Town deserves to kick off the New Year! So come out to the Dirty Dog and witness the strength of Austin Hip Hop! From the what do I do for New Year's department... Check out Austin's Hip-Hop Project with The Cipher and Southwest Key Programs @ First Night Austin on Dec 31st. Come to First Night Austin 2008! On Monday, December 31, 2007, you're invited to play a creative role in transforming downtown Austin. The stage will be the city's plazas, parks, streets, storefronts, and building facades. Indoor venues will be settings for a palette of performing and visual arts. First Night Austin is a public celebration of the arts that revives the ancient tradition of marking the passage of time with art, ritual, and festivity. It is a family-friendly, affordable, and alcohol free New Year's Eve festival. Join us on December 31st and help create a new tradition for Austin that celebrates the culturally rich and artistically diverse place we call home. Don't be confused by the name of the event. First Night Austin 2008 takes place on the last day of this year, December 31, 2007. We will look ahead collectively to welcome the New Year with hope and optimism. From the sittin' in H-Town wondering what to do next department... Adrian Croom wrote in to tell us about Austin Beat Battle @ Flamingo Cantina on Dec 27th. 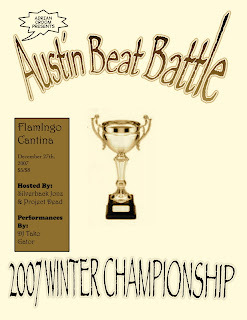 Beatmaker will battle for the Austin Winter Trophy. Tickets are $5/$8. Adrian Croom presents the Austin Beat Battle. This is a head to head producer battle that only leaves one beat maker left on stage. If you're an up and coming beat maker who wants to test their skillz against local talent, then this event is for you. This is a monthly beat maker battle that also features local poets, emcees, comedians, djs, and more. If you would like to compete or to find out more then please send us a message. 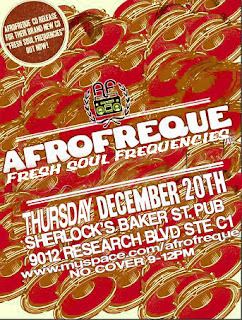 From the feeling lazy today department... Afrofreque @ Sherlock's Pub on Dec 20th. 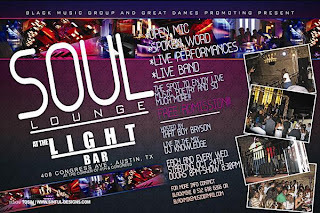 After performing for a sold-out crowd during the original launch of the groups debut CD release, Afrofreque will be holding a second event in North Austin on December 20th, 2007. Reggae soulsters, electronica lovers, and conscious hip-hop connoisseurs rejoice...again! 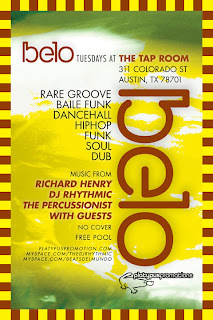 The long-awaited debut release from Austin's favorite groove junkies, Afrofreque, will be celebrated on Thursday, December 20th, 2007 from 9pm to 12am at Sherlock's in Austin, TX. Visit the band's site (myspace.com/afrofreque) to listen to the track Illumination for a sample of the sounds on the Fresh Soul Frequencies album. Fresh Soul Frequencies, available now at DJ DOJO, features ten original tracks written collectively by band members Tigre Liu, Michael Hale, DJ Resinthol, Claude 9, Fumi-Hito Sugarawa, and John Siebenthaler. CD's and t-shirts will be available for sale at the show. Sherlock's is located in North Austin at 9012 Research BLVD, Ste. C1. Admission is free for patrons 21 and up. From the People's Champ department... Paul Wall @ Club Fuze on Dec 29th. Looks like it's the club's grand opening and they're hiring on craiglist. LOL. 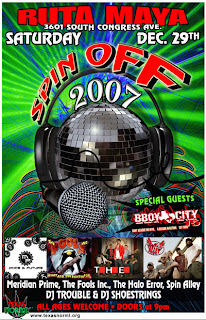 Very obscure, but if you goto the Club Fuze myspace page and click on "Events", it will tell you that you can buy tickets at the club starting today. Paul Slayton (born on March 30, 1980) better known by his stage name Paul Wall, is a rapper, DJ, promoter and jeweller, originally part of Houston hip-hop group The Color Changin' Click.. Wall is a graduate of Jersey Village High School and studied mass communications at The University of Houston for three years. He is affiliated with Swishahouse Records, having released several albums under the label as well as collaborating with other rappers signed to the label. 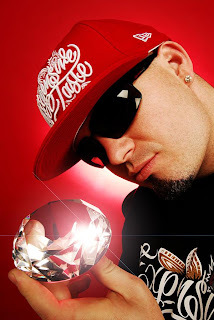 At a young age Paul Wall, along with fellow rap music artist and childhood friend Chamillionaire, decided to make music his career. 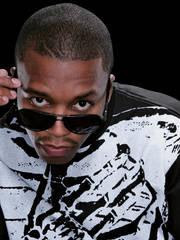 One day while promoting themselves at a Texas event, he and Chamillionaire ran into Michael "5000" Watts, a popular mixtape DJ from northern Houston. After proposing to do promotions for Watts' company, Swishahouse, Chamillionaire and Paul Wall came to Watts' studio and convinced Watts to allow them freestyle on an intro to Watts' radio show on Houston hip-hop station KBXX. 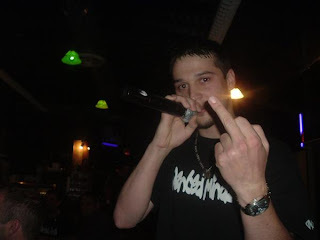 Watts, who was convinced to rap on the record, enjoyed the freestyle so much that he put the verses on one of his mixtapes. The freestyle became so popular in the streets that Chamillionaire and Paul Wall became regular staples on Houston's mixtape circuit, appeared on several of Watts' mixtapes, and became permanent members of Swishahouse. From the hip hop mathematics department... American Drug War movie premiere by Kevin Booth @ Antones on Dec 20th. Performance by The Kriminals, Done Deal, Sane, Southern Made Click, Mash Ent., Throwed House Click, and Texas Young Kingz. Tickets to the show and movie are $10. Get 'em here! All this and you get Alex Jones as your MC! From the rational choice theory department... Kicking off our new year on the right beat... DJ Shadow and Cut Chemist @ La Zona Rosa on Jan 18th! Following in the footsteps of their now-legendary "Brainfreeze" (1999) and "Product Placement" (2001) sets, DJ Shadow and Cut Chemist have outdone themselves. Their new, all-45 show, entitled "The Hard Sell," incorporates eight turntables and two guitar loop pedals, allowing tricks and complexity rarely attempted by a DJ duo. So I just read this great article on Bruce Bueno de Mesquita a political scientist that uses a computer model based on rational choice theory to predict political outcomes. Don't know how accurate the model is, but it's a great read. Check it here, The New Nostradamus. DJ Shadow (born Josh Davis in 1972) is an American DJ, turntablist, music producer and songwriter. He is considered a prominent figure in the development of instrumental hip hop and first gained notice with the release of his highly acclaimed debut album Endtroducing....., which was constructed entirely from samples. 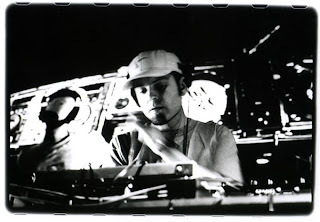 DJ Shadow began his music career as a disc jockey for the UC Davis radio station KDVS. During this period he was significant in developing the experimental hip hop style associated with the California-based Solesides record label. His early singles for the label, including In Flux and Lost and Found (S.F.L. ), were genre-bending works of art merging elements of funk, rock, hip hop, ambient, jazz, soul, and used-bin found records. DJ Shadow is often cited as a leading creator of U.S. trip-hop, a label he contests. Though his music is hard to categorize, his early contributions were certainly important as an alternative to the voice of hip hop and gangsta rap, scenes that never accepted him. He cited groups such as Kurtis Mantronik, Steinski and Prince Paul as influences on his sample-based sound, further claiming that "lyrics ...were confining, too specific". His music rarely features voices or vocal work. . Although he previously released several original works (during 1991-1992 for Hollywood Records) by the time Mo' Wax's James Lavelle contacted him about releasing In/Flux on the fledgling imprint, it wasn't until his distribution association with Mo' Wax that his sound began to mature and cohere. He eventually formed the label Quannum Projects in 1999 out of the previous label Solesides. DJ Shadow has also collaborated with fellow hip-hop DJ Cut Chemist. Together they have created two popular mixtapes entitled Brainfreeze and Product Placement. These mixes fuse jazz, funk, and soul in the framework of a cohesive concept. He has also collaborated with several other artists, including Blackalicious, Zack de la Rocha, Keak Da Sneak, Mos Def, David Banner and Dr. Octagon (also known as Kool Keith). In 2005, Brian Udelhofen began work on the Shadow Percussion Project, an attempt to adapt some of the tracks from Endtroducing... for a live performance group. The result was largely successful and well-received by DJ Shadow himself. In 2006, he signed a deal with Universal Records. 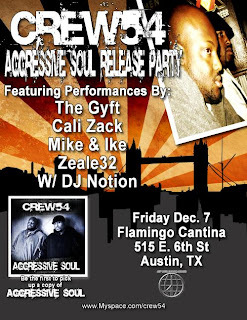 From the Carol of the Bells department... our boys Crew54 @ Flamingo Cantina this Friday, Dec 7th for their Aggressive Soul release party! Congrats, guys! To ring in the momentous night... 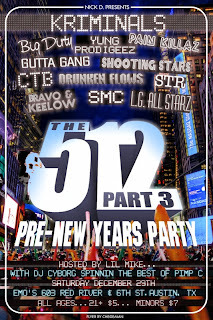 The Gyft, Cali Zack, Mike & Ike, Zeale32 and DJ Notion will also be performing. Check out the latest Crew54 hit, "Keep on Moving", on our player on the right sidebar! I've added a new service to the site, it's called Twitter. You will notice it under the section "Holla" on the left sidebar. I think this will be a great service for all.